The house where I lived, until I left home as an adult, is a typical Queensland house of its era, in a near-city working class suburb. It is on stilts to gain the benefit of cooling breeze, but also to open up underneath for the typical working tasks, sort of like a combined men’s and women’s shed. This under-the-house area was used for carpentering, repairing shoes, tinkering with the pushbike (Dad) or boiling the copper and all the associated laundry tasks, a dry area for the clothes when it rained (Mum); house paint (Dad & Mum); as well as a play area (me). But back to the house: it was built on a plot of land carved off from my grandparents’ large block in the year I was born. It was well constructed in the tradition of the time, with polished timber floorboards, timber cladding and a corrugated iron roof. It wasn’t large and had no verandahs when I was young, though they were added over the years. The underneath of the house was enclosed with timber palings which were painted with tar, a deterrent to weather and termites. My mother was proud of her housekeeping and the house was always well maintained throughout with the tasks being done on different days as was traditional, for example, washing was always Monday and baking was always done on Saturday, while Sunday was a church day and day of rest. Over the years improvements were made to the house, new furniture and decorations bought, wallpaper hung and my mother became particularly adept at, and enjoyed, these various home improvements. We had no TV when I was a child (dating myself now!) only a large radio in the lounge room. In the garden Dad grew beautiful roses and large double gerberas but the landscaping was straightforward and unpretentious with a huge Queensland nut tree (known universally then by this name but now called a Macadamia) at the bottom of the garden. We lived quite close to a creek which flowed slowly most of the time until there were occasional flash-floods. Even though we lived close (horizontally), we were unthreatened by rising water as our street was much higher and at no risk. 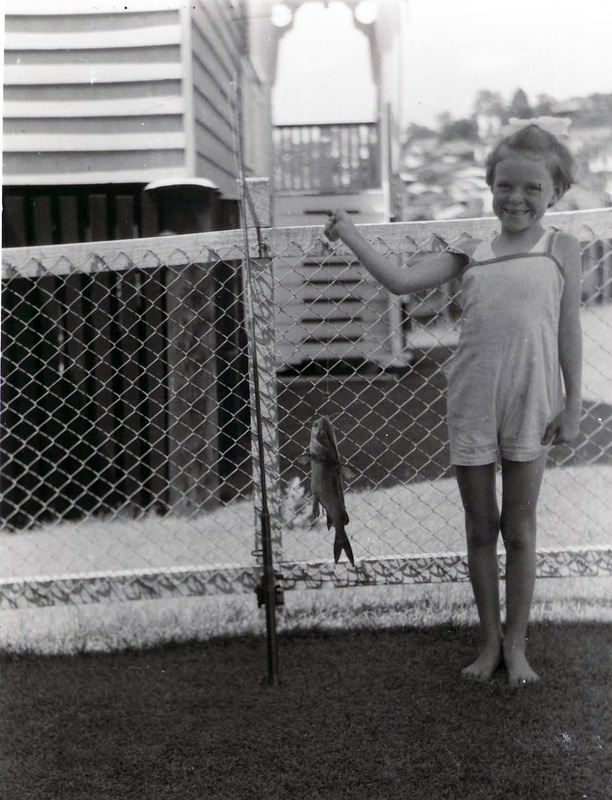 Sometimes Dad & I would go fishing in the creek but by then it had been polluted by the nearby tannery and the best we’d usually manage would be a catfish –luckily it was the adventure that mattered, not the catch! The bush along the creek was a double-edged blessing as it routinely brought snakes to the yard and even as a child I was taught how to respond: stand still for a while, back away slowly, then when far enough away, run like hell…but never panic! The bush also attracted many birds and kookaburras which would come to our landing or a window-sill to be given snippets of meat. In those days before many people in the suburb had cars I have memories of various suppliers coming around in their trucks and vans, dinging a bell to let us know they were there. Otherwise you walked to the neighbourhood store and bought the essentials just as you walked to the neighbourhood public phone to make a phone call. Urgent messages would be passed through those who did have a phone and significant events communicated through telegrams. We’d often walk to the bakery about a mile away to get fresh bread straight from the oven, and you’d pick out soft bits on the way home –but not too much or you’d be in trouble! I also remember my grandfather’s youngest brother coming with his van, painted with slogans and advertising for health products –definitely not the norm in those days. My “home” loyalties were split as I also had a second home next door in my grandparents’ house. It had been built around 1920 soon after my grandfather returned from World War I. It was a bigger house with an L-shaped verandah around two sides of the house and it stood on hardwood stilts, capped by metal to protect the house from termites: a typical “Queenslander”. Their washing was hung on a long line with clothes’ props to raise it up while ours was pegged on that Aussie icon, the Hills Hoist. Clothes pegs were of the sort called, I think, clothes dollies. Underneath the house served the same purpose as my own home but included a workbench which had a vice attached so that I could crack the Queensland nuts which fell off our tree. My grandparents’ house also had a large tank standing on hardwood poles level with the house: rain-water was regarded as very good for the hair and was routinely used for hair-washing. The kitchen had a stove in the recess but I think it was gas not wood-fired by the time I knew of it (ours was always gas). I remember clearly that there was still an ice-chest in the kitchen to keep things cold and the ice-man had one of the vans which came down the street. There was also a meat safe with its metal screening which kept things fresh due to the breeze blowing through it, and protected from insects. The kitchen sideboard was large and essentially country-kitchen style with plates displayed on narrow shelves. My grandmother had a large dining service and I would not be surprised if that had come from Scotland with her when she and her family emigrated. Most of the furniture in the house was made of Queensland silky oak with its distinctive grain. The furniture was probably modern when it was bought, but by the time I was young, it was quite different from my own home’s modern furniture which is probably why it intrigued me. 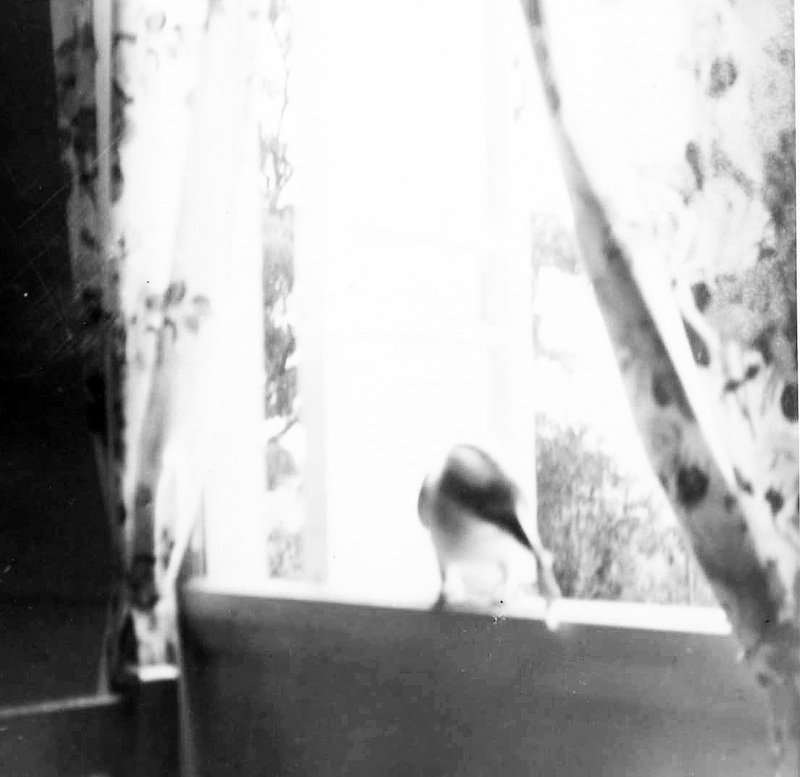 The windows were sash-windows so I really enjoyed ducking in and out of them –a simple pleasure. On the verandahs were timber squatters chairs, yet I don’t remember seeing anyone sitting in them….my grandfather would usually sit on the back steps smoking his pipe. The verandahs were screened partially by lattice and timber slat blinds. Under the verandahs my grandparents grew a massive tub of maidenhair fern and along the side there were hydrangea bushes. Their garden was dominated by a huge mango tree which had been planted when my father was born which I’d climb as high as I dared. Both these homes are still standing but as this near-city suburb has been gentrified, many houses have been modernised or adapted including my grandparents’ house. Not surprisingly I still prefer the original version as it lives on in my head and heart! This entry was posted in 52 weeks of Personal Genealogy & History, Family History and tagged 52 weeks of personal genealogy & history by cassmob. Bookmark the permalink. 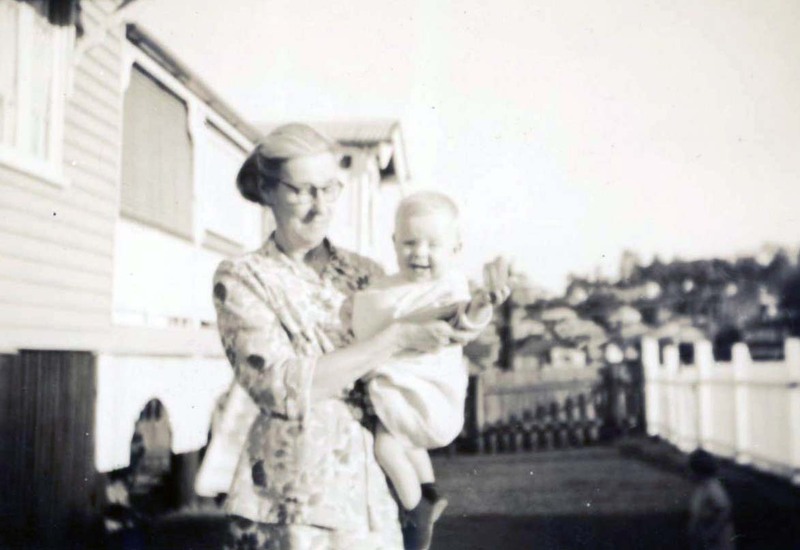 Spending my early years in Brisbane, I can identify with many elements of this story – the verandas around all four sides of the house, where we children rode our bikes and my baby sister slept in her pram, my parent’s cars parked underneath the house, the icebox inside the kitchen and the kerosine fridge on the back veranda near the back door, the laundry and extra clothes lines underneath the house, polished floors ……… thanks for your evocative story. Thanks Annie. There were lots of pleasures about growing up in Brisbane, weren’t there?